I explore in my most recent TEDx Talk how the paradigm shifted. How our perception of streets changed from being accepted as a human, democratic space for 7000 years to becoming perceived as the sole and exclusive domain of automobiles. What is clear is that people generally have a problem seeing differently. You can present them with reams and reams of statistics and evidence that cars have a destructive influence on our societies and that there are too many in our cities but you still hear the same last-century perceptions about how things can't be changed and how nothing should change. It's mind-boggling how people will deftly dance around stats like 35,000 deaths a year on the roads of America alone - and 6 million injured annually - and still come out blind to the obvious danger that citizens are exposed to. "Dude... I still want to drive my car". In cultures that have not been given the benefit of transport choice (Hi, America!) for a couple of generations, such perceptions are sometimes stronger. I have a pile of books from my own childhood. Among them are a number of books by Richard Scarry. Scarry's influence on childrens books was - and still is - massive. I get all nostalgic when I see his distinct drawings and many of his books were about cities. I'm not here to out Scarry as a pawn of the automobile industry... :-) but I've noticed a theme in many of his books, when reading them for my kids over the past couple of years. Look at the illustrations in the graphic at the top. Crazy drivers causing many accidents. All innocent enough. Car crashes portrayed as innocent, oopsy daisy events that are a common occurance in cities. Nobody gets hurt. It's all silly. Most of the illustrations above are from a 1973 book. It's perfectly okay to use telescopes and magnifying glasses whilst driving. Driving into the harbour is no cause for alarm. Crash into a picnic and you're just an "impossible driver". Cause havoc on the many street of a tiny town and it's all just okay. There are a couple of bike examples. Cycling while telescoping and failing to ring your bell when cornering on the sidewalk. By and large, however, it is automobiles that Scarry draws most. 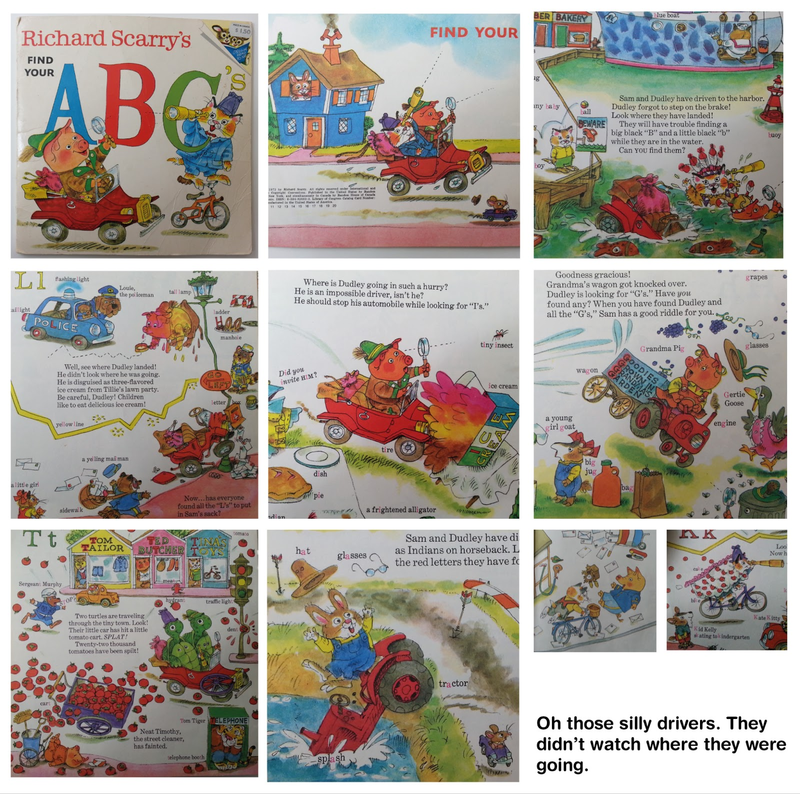 I am wondering, however, about the effect on society when books like Scarry's have, for a few generations, portrayed automobile accidents as comical, crazy things. A normal part of life. Nobody gets hurt, silly rabbit. A culture that sees a distorted view of itself in the mirror of its art and literature will end up pulling a whole lot of wool over its eyes. Do that and you can't see the Bull in Society's China Shop.